While we knew that Mauna Loa CO2 would cross 400 ppm for a month in 2014, it is troubling to see how high it is in April and May. Both the Scripps Keeling Curve and the NOAA/ESRL preliminary concentrations blew through 401 ppm as well! 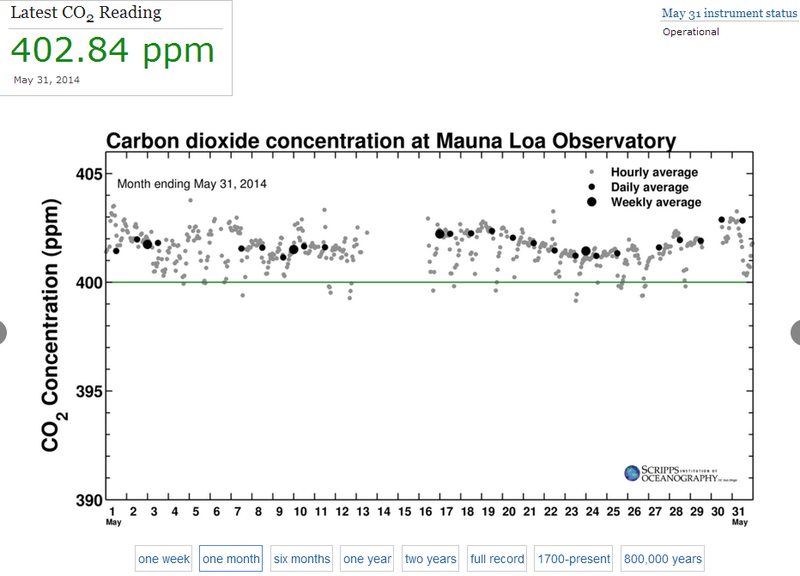 For April, 2014, the Scripps "Keeling Curve" CO2 at Mauna Loa is officially averaged at 401.33 ppm. This is 2.97 ppm above April, 2013's monthly average. As of May 31, the "Keeling Curve" May estimated average is 401.76 ppm. If this is the final average, then it will be about 1.86 ppm above May, 2013. Bob Petz, at ecology.com, estimated in March, 2014 that the May, 2014 Keeling Curve average would be 401.90 ppm, so he was fairly close. MLO readings usually begin to decline about now, but no yet! May 31, 2014 -at 402.84 ppm - is higher than any daily average recorded by Scripps at Mauna Loa! 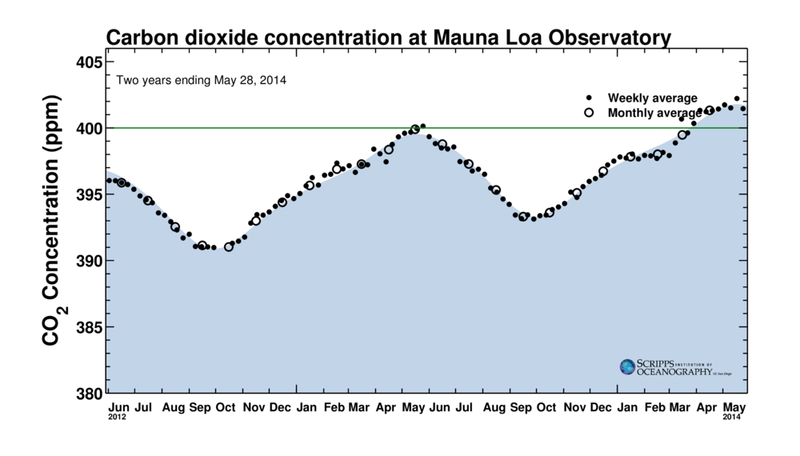 Given these readings, the June, 2014 Mauna Loa CO2 average estimate seems to be on track for remaining above 400 ppm. Bob Petz estimated a June average of 400.70 ppm. I think we may be even higher, depending on drought and average temperatures for the month, perhaps around 401.00 ppm. The Scripps MLO CO2 May to June monthly average decline is only -.64 ppm when calculated using 1997-2013 changes. The two year trend reflects the increasing global CO2 emissions. Bob Petz estimates the Keeling Curve 2014 annual MLO CO2 average will be 398.5 ppm. Given that we are running slightly lower than his estimates, and that early El Nino years have lower increases, my assumption is closer to 398.3 ppm. Time will tell. The NOAA/ESRL April, 2014 MLO monthly average was 401.305 ppm, an increase of 2.95 ppm over April 2013, perhaps fueled by the warming Pacific and scorching Indian Ocean heatlng. The preliminary May, 2014 NOAA/ESRL average is 401.86 ppm, an increase of approximately 2.10 ppm from May, 2013. For June, 2014, it seems very possible to have a monthly NOAA/ESRL MLO average above 401.00 ppm, since the average monthly change for May to June is only -.62 ppm. Thus it is possible that the next month average will be above 401.00 ppm as well. The World Meterological Organization announced last week that the ground station readings for the entire Northern Hemisphere were above 400 ppm for the first time. 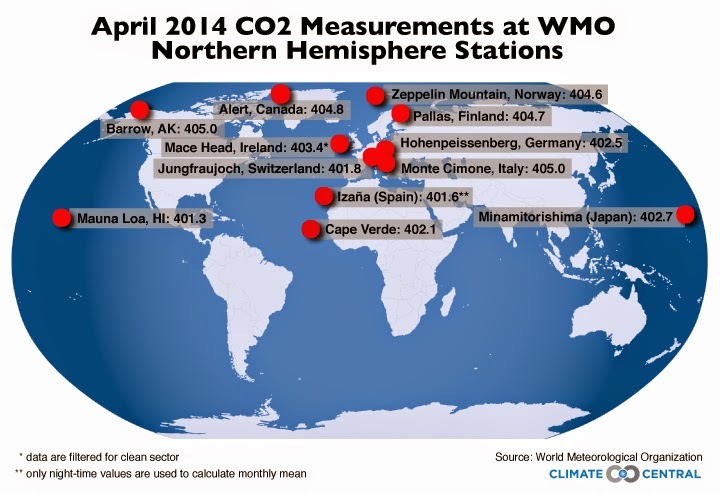 The larger number of stations measuring CO2 are in the Northern Hemisphere and it is the source of most land emissions. It is estimated by the WMO that the global CO2 levels will not reach 400 ppm until 2015 or 2016. Satellite data provides another perspective and makes the point that there is actually a potential higher concentration of CO2 in the Antarctic than is being measured by ground stations. Only small areas in the image have CO2 concentrations above 400 ppm (the pink shades) , and even less above 410 ppm (yellow). Here is the comparison for May 29, 2014 12-24 hrs. More areas are clouded, thus lowering the global ppm readings to 397 mb, there are higher CO2 concentrations over 410 ppm over Antarctica. The Metop 1 imagery reveals more coverage, bumping the global CO2 mean to 398 ppm, with considerable areas of Antarctica over 410 ppm. If we had as many GHG observatories in Antarctica, it is quite possible our global readings would be far higher than currently presumed. While one might say that these readings are lower than the April, 2014 Northern Hemisphere CO2 at 400 ppm just announced, here is the May 29, 2014 12-24 hr 586 mb level CO2 image from Metop 1, that makes these higher Antarctic readings more apparent. At lower levels, the concentrations are as high as 402 ppm at 918 mb.